Yesterday I spoke to the nation's governors at their annual meeting in Washington, D.C. They are grappling with more than state budget deficits; they're also confronting deep education deficits. 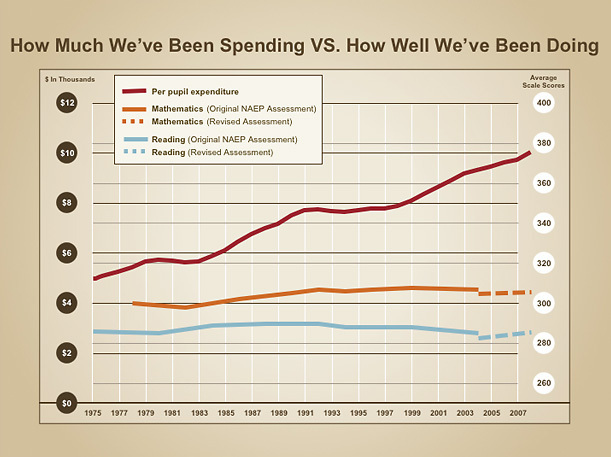 I encouraged them to flip the curve on how much we spend vs. how well students do in school. Over the last four decades, the per-student cost of running our K-12 schools has more than doubled, while our student achievement has remained flat, and other countries have raced ahead. The same pattern holds for higher education. Spending has climbed, but our percentage of college graduates has dropped compared to other countries. To build a dynamic 21st-century economy and offer every American a high-quality education, we need to flip the curve. For more than 30 years, spending has risen while performance stayed flat. Now we need to raise performance without spending a lot more. When you need more achievement, you have to change the way you spend the money. This year, the governors are launching "Complete to Compete," a program to help colleges get more value for the money they spend. It will develop metrics to help show which colleges graduate more students for less money, so we can see what works and what doesn't. In K-12, we know more about what works. Of all the variables under a school's control, the single most decisive factor in student achievement is excellent teaching. It's astonishing what great teachers can do for their students. Unfortunately, compared to the countries that outperform us in education, we do very little to measure, develop, and reward excellent teaching. We have been expecting teachers to be effective without giving them feedback. To flip the curve, we have to identify great teachers, find out what makes them so effective, and transfer those skills to others -- so more students can benefit from top teachers and high achievement. Compared to other countries, America has spent more and achieved less. We need to build exceptional teacher personnel systems that identify great teaching, reward it, and help every teacher get better. It's the one thing we've been missing, and it can turn our schools around.